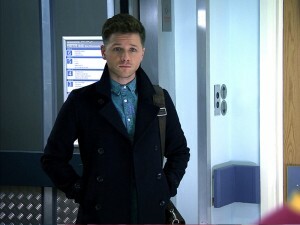 David Ames returns to HOLBY CITY this week as F1 Dominic Copeland, who left Holby in a cloud of shame last year. 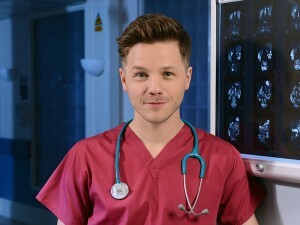 David talks to holby.tv of what we can expect from Dominic – can he redeem himself? Why is Dominic back in Holby? He is back due to the fact he is incredibly ambitious. The storyline that happened earlier last year was a massive blow for him; he has struggled to regain respect. He lied in court but was also under a lot of psychological stress at the time. This was able to be looked over and he was able to repeat his year and return to Holby. But obviously there are still issues with him doing that! Playing a part in Malick’s story, was it a surprise that his return had nothing to do with Malick and came after his exit? It did surprise me a bit as I thought he could be integral to that storyline but in many ways I’m glad that it is sort of a closed book for Dominic and he is able to come in on his own merit and move on from what happened last year. What happens in his first episode? The first episode back is very much dealing with the aftermath of him leaving. Malick was so much loved by the audience and by all the characters in the hospital. Having put him in the position that Dominic put him in means he has a lot to answer for. In many ways it’s incredibly brave for Dominic to return, some would say naïve. What is his reception like on arrival to Holby? His reception is an interesting one. Obviously there are a few that don’t know anything about it and that is something Dominic deals with if and when it happens. He doesn’t want to be labelled by this event and what went on with Malick. He’s a very ambitious doctor and is very much pushing his career forward in any way he can. However with certain other characters such as Arthur who was incredibly close to Malick; that’s going to have to be a bridge he’s got to try and rebuild from scratch. It is going to be quite eventful for him. 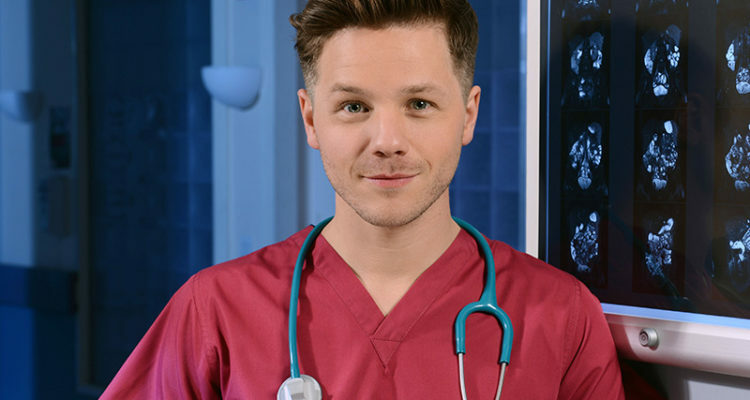 How about his relationship with Zosia? Dominic befriends her and that is quite a different dynamic. Due to the fact that he is dealing with a clean slate so to speak, he tries to keep it that way although obviously people talk; there are no secrets! He does do what he can to try and retain some form of respect and dignity. It is a struggle because of what previously went on; there are preconceptions from some people. Zosia is also very ambitious, do you think this is what attracts him to her? Absolutely, Zosia is someone who has an interest in Psychiatrics and Dominic is definitely an interesting person to observe so they bond and they equally intrigue each other. I think a gay man is always attracted to a strong independent woman so it’s kind of natural for all the people there that Dominic seeks out the one person who fits that bill, but also has no idea about his past! Is it also handy that she’s the boss’s daughter? We’ll have to wait and see with regards to how he uses their friendship but with Dominic there are no holds barred! If and when he does that I don’t think he would think that was at all wrong; he’d justify it and believe it. Any chance of some romance for Dominic? At the moment he is very much focused on his career, so he’s got enough to deal with. What happened previously was a massive deal so he’s trying to get back on track. I think it’s very much a conscious decision to focus and makes sure he’s giving this 100%. He has the potential to waver easily when it comes to love but at the moment it’s a big no no for him. It must be nice to be back for you? It is one of the most lovely, fun jobs I’ve ever had! I’m one of those smug, lucky people who get up every day and say I love my job. I was very nervous coming into Holby earlier last year as obviously because it is this continual beast you do feel like you’re walking into someone else’s domain. Everyone else who works here; the cast, crew, writers, everyone – it’s something they continue to do, so coming in on a temporary basis, I was aware I was going into something everyone else knew really well. It was all very new to me but within days, I felt so comfortable and everyone was just so welcoming. Knowing you can go into that kind of job and everyone being so wonderful, you immediately feel like you’ve been there longer! You have to build a rapport with other actors quite quickly depending upon storylines; say if you have a shirtless scene and you’ve got to kiss a character in a tiny locker room – you’ve got to break down a few walls pretty quickly in order to be able to do that! Was it always a long term plan for Dominic to return? I had no idea. I didn’t know what they had in store for Dominic. For me on a practical, actor level, I wasn’t sure of what would happen to him. From a viewer’s point of view the story was very much open ended for Dominic. The focus of that past story was what was going on with Malick and what was happening with the mother and daughter; that was the main storyline so Dominic’s tale was left which made an easy segway to be able to come back and continue that story. So do you feel there is some unfinished business coming back to Holby both as an actor and for your character? Absolutely both. For me it is a real pleasure to develop with a character. There are so many other formats of entertainment; music, theatre – everything that has a very short life for an actor. Theatre you can do a run of a show but it’s a different beast; you can get submerged into a character but still it has that little shelf life and the story is always the same every night whereas it’s lovely to get a character that you can play with and work on week by week. He changes, he adjusts and there are different stories, different ways of playing certain situations and that is fascinating for an actor and is so much fun because you have so much to work with. It’s lovely working with a team and that you can have input on. It’s going to be interesting to see what happens with Dominic due to the preconceptions that some people will have and the knowledge that other people have; facts getting mixed up with fiction with regards to what happened so he has a lot to prove. It must have been a nice surprise for you to learn of his return? Yes it was. It was very strange actually, I was sat at a friend’s house having an afternoon cheeky glass of wine in his garden and he asked me what was happening with it at the moment and I said I didn’t know but within seconds my agent phoned me! It was quite eerie really but was quite good as my friend had a fully stocked fridge! So that was quite a lovely afternoon/ evening, not so much the following day but still. Our Producer, Simon Harper, I am incredibly grateful for. It remains to be said one of his first decisions was to bring back my character, which is very lovely because Dominic is mischievous, he gets up to no good even though he will do all he can to put across the persona of butter wouldn’t melt. So that is something that is very enjoyable to play. He can very much turn his emotions on and off as and when it suits him. It’s enjoyable to see what his motivations are and what he does; a lot of which is to better himself and his career. He doesn’t seem to have many issues with how far he needs to go with that. He is definitely going to spice things up and he is someone who causes a lot of sparks. Working alongside Arthur especially is going to prove fun but also difficult. He won’t build bridges straight away; he has fun and pushes some buttons when he needs to. So he’s not totally a reformed character? Not totally by a long short. He is as I say very ambitious; he will put is job before anyone else’s job and he will do as has proven in the past, which does cause friction along the way. It’s a learning curve for him as well. Do you think we will get an insight into the way Dominic acts how he does? As time goes along I’m sure things will slowly uncover as to what makes Dominic tick. He is a very intricate character, seemingly with no moral compass to speak of. He makes things work for him and justifies that and will see things as black and white. His frankness is something I have warmed to immediately and his ability to augment situations to benefit himself. Definitely you will start to see a little bit below the surface. With all good characters, after a while you have to see what makes them tick, and why he does what he does. What has been people’s reaction to Dominic in the past? I enjoy using social media such as Twitter; there were lots of different reactions on there. The majority of them were very positive. Some people were massive Malick fans so they weren’t so kind but it was wholly positive! He’s definitely a character that’s going to evolve within the show and be shaped by it. How have your family reacted to you joining the show? My family are massive fans of Holby. My Nan in particular has always been a fan so it’s lovely to hear their reactions to the character and they are forever trying to get the gossip from me of what’s going to happen! A few years ago my aunt died of cancer and Holby was also her favourite show and only a week before she passed away, I had oddly had an audition for another character on Holby. My aunt said to me that it would be really weird if I ended up on the show because it wouldn’t be real to her anymore! So when I finally got the role of Dominic, I told my Nan and she said that my aunt was looking out for me. So it really meant a lot to then come and do this show; it means something more to me and my family. What work had you done prior to Holby? I’ve always had a strong work ethic, coming from a very working class background, I can’t just sit around and wait for someone to send me a script; I get anxious and bored! I’m not one of those resting actors, I have to get out and work otherwise my mind wanders too much. I was in an episode of Doctor Who in 2009, one of the special episodes with David Tennant; that opened up many doors to me job wise as an actor. It was such a great experience but from that I‘ve made connections with a company called Big Finish, who I’ve done some audio series for. That’s always lovely, continual work, so whether doing voice overs, theatre or working in a restaurant, I do just work! No Comments on "David Ames Interview"